The next installment of in the series of games from Monster Games is a reboot of the popular series, which began in 2000 with the iconic NASCAR Heat. The game is a continuation of NASCAR Heat 2 from 2017. NASCAR Heat 3 is another part of a series of racing games dedicated to the NASCAR series. The production was developed by Monster Games studio, which consistently develops the brand (responsible for NASCAR Heat 2000, NASCAR Heat 2002 and NASCAR: Dirt to Daytona, among others). 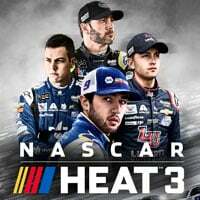 NASCAR Heat 3 puts you in the driving seat of the NASCAR Xfinity Series, the Nascar Camping World Truck Series and the Monster Energy Cup Series. The races are held on several dozen authentic tracks (including a few completely new ones, unprecedented in the previous ones), with real cars and drivers. Thanks to the possibility of adjusting the settings of the driving model (more simulative or skilful to choose from), the game is suitable for both experienced drivers and newcomers. NASCAR Heat 3 can be played alone or in company. The basis of the game is an extensive (more so than in the previous part) career mode. It allows us to lead the entire racing team and fight for further wins. Additionally, players can compete in multi-player mode, also in the framework of previously unavailable tournaments. The cherry on the proverbial cake is in the Xtreme Dirt Tour mode, where we race on asphalt-free surfaces. NASCAR Heat 3 is characterized by a robust, three-dimensional graphic design. Particularly impressive are the faithfully reproduced models of cars, but also the trails can be accused of nothing.